Use to hold trim at the angle required, eliminating the need for advanced compound miter cuts and difficult 'coping'. Curved design compensate for a wide variety of crown molding spring angles, and its extension arms let you work with crown up to 5-1/2" wide with a 12" saw and 3-1/2" wide with a 10" saw. Add safety and convenience to your Precision Router Table with this incredibly handy power switch. Features a 2 plug design which allows it to control two independent devices at once. Key-Lok which eliminates accidental power-on, and a long 8' heavy-duty 14 gauge power cord. 15amp, 120v. 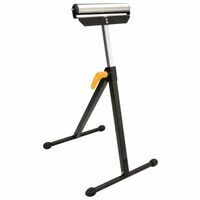 Heavy-duty all steel construction, stand supports up to 400 lbs. Universal design accommodates all brands of miter saws, including 12" sliding miter saws. Quick-release mounting brackets for easy miter saw mounting and removal. Tool-free adjustment of material supports and extension arms. Material supports include rollers and positive stops for repetitive cuts. Weighs 41.8 lbs. Portable tile saw stand for No.MK370 EXP model tile saw; weighs 3.1 lbs. This adjustable and durable table is built to last. Comes equipped with levelers to compensate for uneven floors. The stand has predrilled holes that make it easy to mount accessories and to customize the stand. Versatile, system-ready design for all Kreg table top solutions, including the Klamp Table and the Precision Router Table Top. You can also use it to create a custom tool or work stand for your shop. Made from heavy 12 and 16 gauge steel and can be adjusted from 31" to 39: (78.7 cm to 99.1 cm) in height. Includes (4) leveling feet and assembly hardware. Combine with the Router Table Top (5100797) and the Router Table Fence (5823109) to assemble into the PRS1045 Router Table.